Sharpened and sanitized pruners and other tools can decrease the chance of spreading disease. Sadly, there are a lot of dull, rusted tools out there, even on productive farms. If you watch the videos at the end of this post, you will hear “Rust is always a sign of neglect” so let this be the end of neglect. Put your tools “to bed for the winter,” or prepare them for pruning season, right around the corner. There are three main parts of tool maintenance: clean, sharpen, and lubricate. These three steps should simply be done, in that order, every single time a tool is put back in the shed. The more often you do it, the easier and more effective it is at improving the lifespan of your tools. Clean: There are three steps - cleaning off debris, removing rust, and sanitizing to prevent the transfer of disease. Proper cleaning may require removing screws and partially dismantling the tool. Clean – Pressurized water, or a wire brush and a little soapy water are effective when used to scrub off all dirt and debris from your tool. Rust? – Sometimes, especially if your tools have not been constantly maintained properly, you may see a rusted tool that just isn't what it used to be. Don't worry, if you have this problem, there are some easy tips that can help take that rust off. Spray the tool with vinegar, wrap in a paper towel and cover in plastic for about three hours, up to 24 hours. Remove the paper towel and plastic. Use a brush, an old toothbrush works just fine on small projects, put some baking soda in water and use the brush to scrub off the rust. Turpentine and steel wool also work well. After you scrub the tool to remove the rust, rinse thoroughly with water. Sanitize – To ensure your tools are not going to spread disease around your farm, sanitation is important. Wipe down the tool surface with a 10% bleach solution (10 parts water to 1 part bleach), leave it for 30 seconds and then rinse thoroughly with water. Be sure to dry and oil your tool after sanitizing to be sure it does not rust from the bleach! Learn how below. Sharpen: Many tools, even though you may not think of them as having a blade, actually require frequent sharpening to ensure their consistent function. A shovel, for instance, needs sharpening on the edge, which helps cut through roots, make clean holes, among other things. The basic method of sharpening is pretty simple. Use caution when sharpening and be sure to wear the proper protective equipment, such as gloves and eye protection. 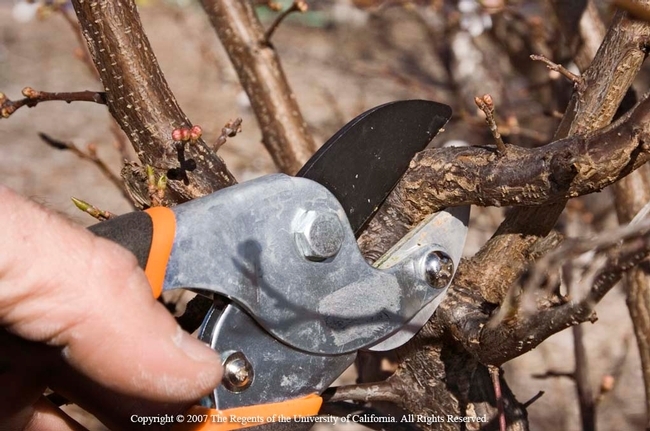 Stabilize – Small tools, such as hand pruning shears, may easily be held firmly with the non-dominant hand. Larger tools, such as mower blades, or loppers, may need to be held in a vise. Sharpen - Locate the proper edges to sharpen. Remember that there is a cutting blade and a bypass edge on some tools like pruning shears. You only need to sharpen the blade. A file can be used and should only be pushed in one direction. Hold the file at an angle, usually 45 degrees to the blade. Be sure to lubricate the blade and properly tighten screws after sharpening. If you would like to pay a professional to sharpen your tools, at our January 9th Farmer-to-Farmer Breakfast, Ruben with Sharpening Tech will available to sharpen tools. Watch for an announcement on the Foothill Farming Calendar. Lubricate: It is very important to oil your tools, even if they do not need to be sharpened. Oil helps keep the rust at bay. If your tool comes in contact with food crops or soil, we recommend a plant-based oil, like linseed oil for wood handles, and vegetable oil for pruners and shovels. This should happen each time your tools are put away. 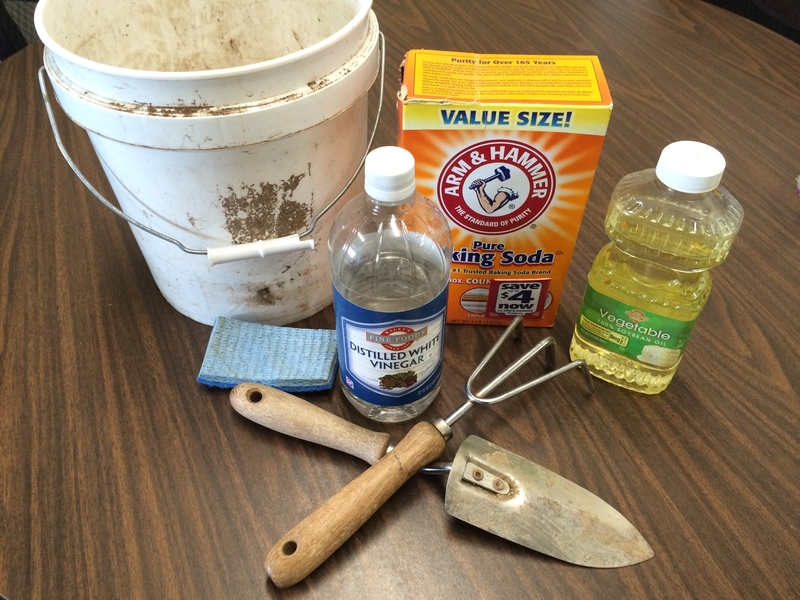 A barrel or bucket with sand and a small amount of oil left near your tool shed will work. Simply stabbing the tool in and out of the sand mixture can remove debris and oil the tool at the same time. Store your tools standing upright or hanging, this also helps prevent rust. Develop a system to maintain your tools and always have them in their correct place so that anyone working in your operation can find the right tool anytime. Livestock Advisor Dan Macon has developed a system of sharpening his tools and oiling all the handles on New Year's Eve each year. He also prepared a lambing box, and outfits it with sufficient supplies and freshly sharpened tools each year before lambing season. What systems do you use, or need to use, to be prepared in your operation? Winter seems to drag on forever, doesn’t it? In October I can’t wait for winter. I am tired of being hot and sweaty. I am tired of eating tomatoes. All I really want to do is eat leafy greens, stay inside by the fire, and read a good book. Now that it is January. I am tired of leafy greens and long for a tomato. The reading by the fire part I am still enjoying. I won’t say I have spring fever, but I am definitely feeling the call of the land. This happens every year in January. I can feel a certain buzz throughout my body that I can still only by doing something farmy. What is a farmer to do when the weather does not allow outdoor farmy activities? I do a couple of things to calm my inner worker bee. The first thing I do is I plant tomato seeds. I plant more than just tomatoes. I plant all sorts of things: peppers, eggplant, celeriac, and broccoli raab. I have to keep myself under control because more than once I have started seeds too early, only to have the plants ready well before the soil is dry enough to work up for planting. Seedlings that are over mature at planting time never reach their true potential. So it is better to wait a few weeks rather than grow a bunch of plants you should never plant in the first place. The second thing I do is make sure all my equipment is ready to go. I want to be able to capitalize on weather breaks and work up some ground, and maybe even plant some things like carrots, beets, or lettuce. I change the oil in all the tractors and do whatever the owners’ manual says in terms of lubrication and adjustments. Once the tractors are done I start working on the implements I attach to the tractor. I always start with the tools that have a gear box, like mowers and tillers. I check all the fluid levels and replace the fluids if the manual tells me to. I like to adjust the drive chains on the tiller, and January is a good time to replace any worn out leaky gaskets. This year I get the fun job of replacing all the tines on both of my tillers. (Actually, this is not fun.) If you have ever had to replace tiller tines you know what I mean. I have 72 rusted bolts just waiting to frustrate me. Hello, liquid wrench. While I am talking tools I should pass on two items of farm wisdom that I always find valuable. The first one is: grease is your friend on the farm. The second is: your hand is not a hammer. I was told these gems by an excellent farm mechanic, and I do my best to take them to heart. Whenever I use a piece of farm equipment I grease it first and when I need to beat on something I try to find the appropriate beating tool and preserve the integrity of my hand. This is especially true when working with wrenches to loosen stubborn nuts and bolts. Use a mallet to tap on that wrench not the palm of your hand that is unless you really want to have carpel tunnel syndrome. Every tool in the farmer’s and gardener’s tool shed needs a little love once in a while, so take the time this winter to oil all your wooden tool handles with linseed oil and make sure you sharpen all those hoe blades. Spring is coming and so are the pig-weed, lamb’s quarter, and whatever other weeds you have that make you crazy. Sharp tools will make the job of killing all those weeds easier and faster. The sun is shining, but the soil is cold so get out to your tractor shed and tool shed and do a little work on your tools so you are ready to go once planting season gets here.